An interest in music, history and architecture led Dennis Pratte to sign up to become a volunteer for SPMH. Music Hall has all three! He joined the program in April 2017, went through orientation and training, and ready to lead tours as soon as the structure reopened in October of that year. 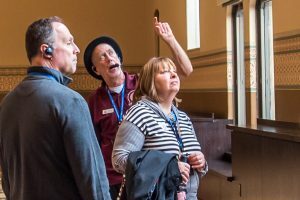 In addition, Dennis gives informative and entertaining “Beyond the Bricks” outreach presentations, taking Music Hall history and photos via PowerPoint to meetings and gatherings in the Greater Cincinnati area. I like meeting people on the tours and being able to give them some music hall history and taking them behind the scenes. In addition to SPMH tour duties at Music Hall, Dennis is also volunteering at the Cincinnati Association for the Blind and Visually Impaired and CET. In past years, his volunteer work has included the Walnut Hills Soup Kitchen, Ronald McDonald House, Healthy Cooking Classes at the Over The Rhine Kitchen and the Cincinnati Blues Festival. Dennis not only enjoys listening to music but he also plays guitar, ukulele and accordion. Dennis has lived and worked in Europe and Asia. Like many who work abroad, he enjoyed discovering and eating the local cuisine. However, if you ask him about it, he’ll tell you that while he was in China, he ate rat. His assessment: It does not taste like chicken.